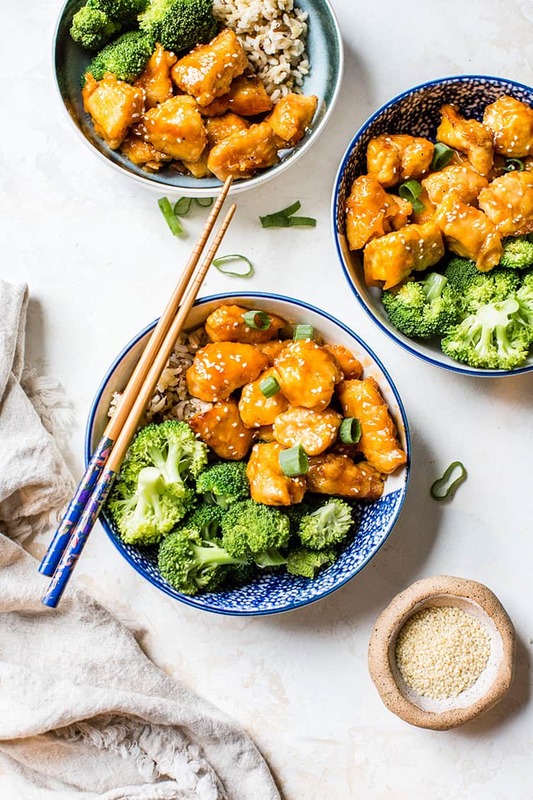 This sweet and sour chicken recipe starts with a cornstarch and egg batter, is pan-fried, and then baked in a sweet and tangy sauce. Serve alongside steamed rice and vegetables; a delicious dinner that can easily be scaled up as needed. Confession: I was a serious late bloomer when it came to eating Chinese food. I went to college, lived in a dorm, lived in an apartment, and yet never did a morsel of Chinese food touch my lips. I’m not exactly sure how this happened – we did our fair share of take out, but it seemed to always be pizza (or the leftovers from a friend’s shift at Kentucky Fried Chicken – when she closed, she got to bring home any leftover food, so a handful of us would gather in the hall of the dorm and have a makeshift KFC picnic at 11pm with what she would bring back. We were partial to the potato wedges and chocolate cake, naturally). It wasn’t until I started dating my husband that I gave it a try – he suggested ordering it one night when I was visiting him, and he was (of course) stunned when I told him I had never had it, so I’d just get whatever he was having. That day, we had General Tso’s and egg rolls, and I was in love. Since then, I’ve eaten Chinese takeout countless times, have tried tons of different dishes, and have made many of them in my own kitchen. This is my favorite riff on sweet and sour chicken! There are no doubt a million different recipes for sweet and sour chicken batter; this is a simple two-step dredging. First, you toss the pieces of chicken in cornstarch, and then they are dipped in lightly beaten eggs. The cornstarch helps to keep the outside of the chicken slightly crisp, while the egg will give the exterior a bit of a puffy texture. Once you batter the chicken, heat vegetable or canola oil in a large skillet and brown the chicken in two batches. After they are all cooked, the chicken is removed to a 9×13-inch baking dish and placed in a single layer. Arguably the most important component of the entire meal, this sauce is a combination of sugar, vinegar, ketchup, soy sauce, and garlic powder. It is whisked together in a small bowl and drizzled over the pan-fried chicken in the baking dish. The sauce is the absolute perfect balance between sweet and tangy and the way it clings to the chicken is glorious. You can change it up by using pineapple juice instead of vinegar! The amount of sauce is enough to coat the chicken, so if you prefer a much saucier dish (enough to coat the rice, too) then you will want to double the sauce for sure. The last step! 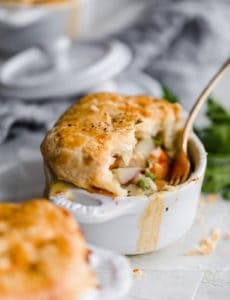 The pan of sauced-up pan-fried chicken bakes for one hour, and I recommend flipping the chicken over every 15 minutes so that it is continually basted in the sweet and sour sauce and it really adheres well. You get the benefit of pan-frying to get that wonderfully crispy and “set” exterior batter, along with all the goodness that comes from the chicken baking in the sauce for a long time and really soaking it up instead of just being tossed in it at the end. 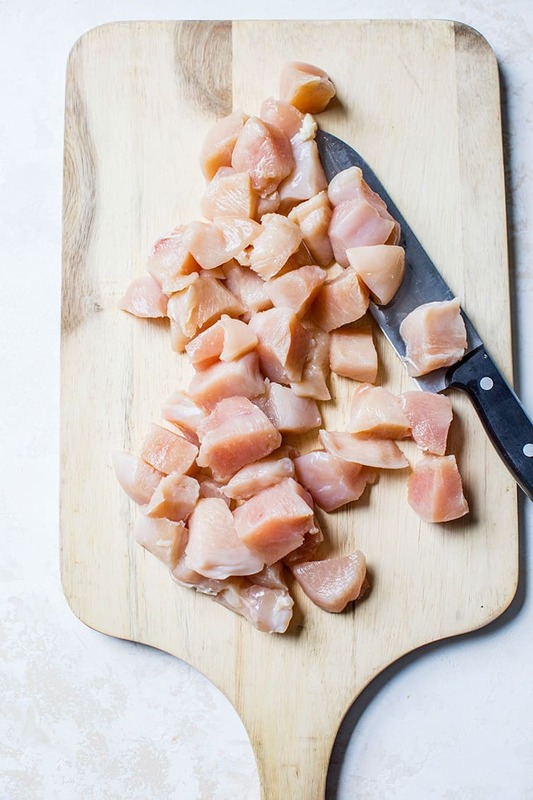 You can use a combination of chicken breasts and thighs, or all thighs, if you’d prefer. The recipe calls for rice vinegar (an Asian pantry staple), but you can substitute white vinegar or apple cider vinegar if necessary. You can double this recipe without an issue. For a slightly different flavor, use pineapple juice instead of vinegar in the sauce. Switch it up with pineapple chunks and diced red and green peppers mixed in the chicken. Serving suggestions: steamed rice along with steamed or stir-fried vegetables (think broccoli, carrots, snow peas, etc.). While you could do this in a slow cooker in lieu of baking in the oven, the sauce won’t reduce and thicken as much as it would on the stove, so take that into consideration. If you like a recipe with a lot of sauce, I recommend doubling the sauce. This recipe, although it takes awhile to get from the stove to your plate, is well worth the effort. The flavor of the sauce is perfect, the texture of the chicken is wonderful and all together, you’d think you ordered this from the neighborhood Chinese restaurant. 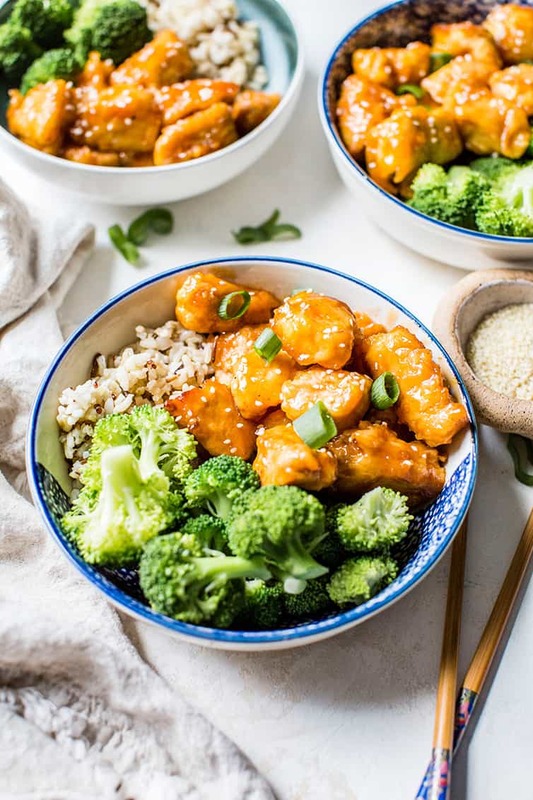 This sweet and sour chicken recipe starts with a cornstarch and egg batter, is pan-fried, and then baked in a sweet and tangy sauce. Place the cornstarch in a shallow bowl or pie plate. Place the eggs in a separate shallow bowl. 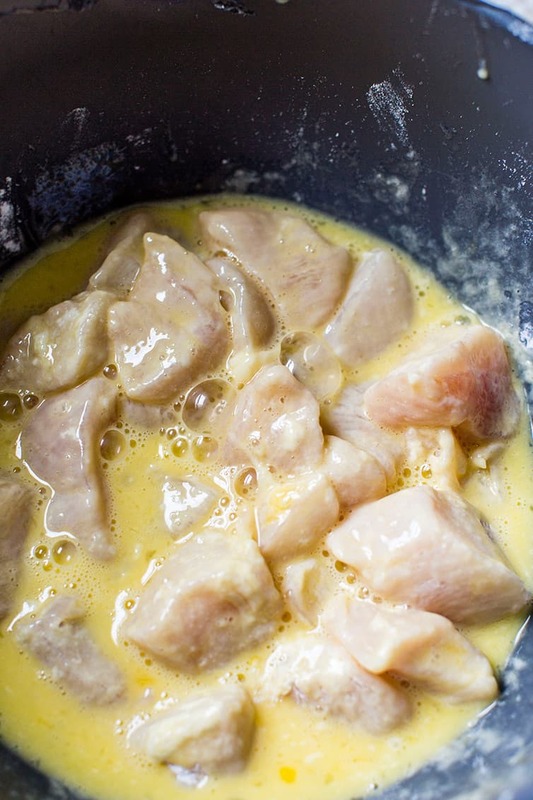 Working in two batches, toss the chicken pieces in cornstarch and then coat with the egg. In a large skillet, heat the oil over medium-high heat. Again working in two batches, brown the chicken, turning it so that all sides are browned. Place the chicken in a single layer in a 9x13-inch baking dish. In a small bowl, whisk together the sauce ingredients and pour evenly over the chicken. Turn the chicken to ensure each piece is coated. Bake for 1 hour, turning the chicken every 15 minutes. Serve with rice and steamed broccoli, if desired. You can substitute white vinegar for the rice vinegar. This recipe can be doubled without an issue. 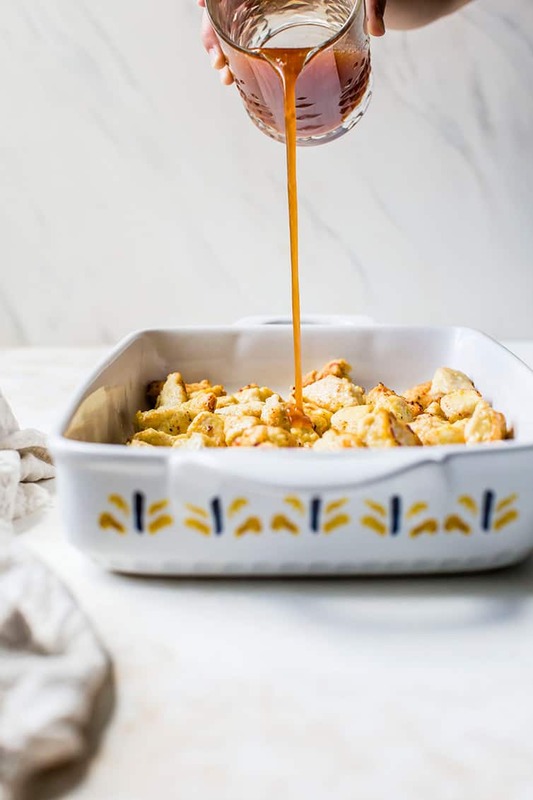 Some reviewers have noted that the sauce is too thin for their taste; you can double the sauce, use half as directed and simmer the other half in a small saucepan, then drizzle on top of the chicken or toss for a super saucy dish. While you could do this in a slow cooker in lieu of baking in the oven, the sauce won't reduce and thicken as much as it would on the stove, so take that into consideration. Update Notes: This recipe was originally published in June 2009. Updated in October 2018 with new photos and additional recipe notes. « Previous PostDominic’s 2nd Birthday Party! What can I use instead of soy sauce? I am not a big fan….. I love the colors in this! That is so exciting! This was amazing! My husband said it was better than the sweet & sour chicken at restaurants. I was a little hesitant about how the ketchup would work out in the recipe, but the flavors blended really well. Thx for sharing this recipe! Fabulous recipe. Cant wait to try it as it was posted. But I couldnt wait and had chicken that was already cooked so I diced it, coated it, fried it with some sesame oil and set it aside. For the sauce I used half pineapple juice half vinegar and omitted the sugar and used a tsp of brown sugar instead, and added a little corn starch to thicken it then heated that until it thickened. Served it over the cooked chicken, leftover broccoli and cauliflower rice. Quick, easy and delucious! Mmmm! I was in my mid-40s before I ate Chinese food. The problem was lack of access to it. My first meal was also Gen. Tso’s and egg rolls. I haven’t had Thai yet, but I have had Japanese and Vietnamese food — both of which I like. Have you attempted or perfected egg rolls yet? I have two recipes for egg rolls. One I use for the filling and also for “crack slaw”/egg roll skillet and the other has great tips for making egg rolls. The sweet and sour chicken looks great! I haven’t tried making egg rolls yet; feel free to email me your recipes if you’d like! I never ate Chinese food growing up either. 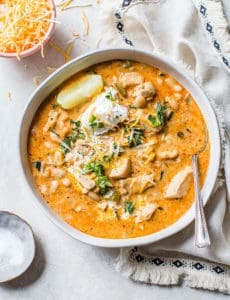 My husband loves it and this recipe looks so good!!! This looks so good, I should try this recipe soon! Just made this for dinner with some rice, carrots, and snow peas! I used apple cider vinegar and half chicken thighs half breasts, and it turned out great!Really delicious, and easy enough an 18 year old like me can do it c: Accurate cook time, cost me less than $10 which is great! I cooked the snow peas and carrots in the last 15 minutes in the same pan as battering the chicken. This is the best sweet and sour recipe. I have been making the sauce alone since I found your recipe back in 2009. My husband says it is better then any restaurant sweet and sour sauce. So when I go buy Chinese food we use your sauce recipe instead of their sauce. Very delicious. I have made this many times and have been asked for the recipe. I made the recipe it is very good. I have one comment, I found it to be a little too sweet. The next time I will cut down on the sugar. I am diabetic and this recipe isn’t diabetic friendly. So I will start by adjusting the sugar on the next go around. I will also add some crushed red peppers for a little more of a kick. Instead of have brown or white rice I served the dish with cooked bulgur. My kids enjoyed the whole dish and wanted more. I was looking for something different and came upon this recipe. 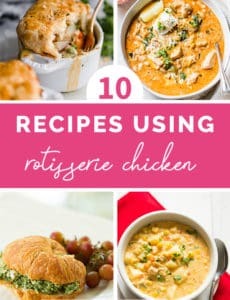 I’m so glad I gave it a chance because I had my doubts about it, but it is a wonderful recipe and easy to make.. So good that I am making it again today. Looks tempting. Could you please tell if this works for other parts of the chicken, or this HAS to be a breast. And also, how much is a “cup” in terms of grams? Cornstarch is a must? What if I can only get potato starch? Wow, thanks a lot! What I guess I couldn’t make clear is that how much water (as a most common thing in the world) does a cup you are referring to holds. I am relatively new to cooking, so I am just learning this. Thanks so much for this recipe! It was a definite hit with my husband who happens to be a big fan of Sweet and sour chicken. I came across this recipe the other day while looking for sweet and sour chicken on Pinterest. My family (husband, in-laws, son) LOVED IT. It was perfect on plain white rice. I am a vegetarian so I followed the exact same recipe but used extra firm tofu instead of chicken and it was incredible. I only had to bake it for about 40 mins for the tofu. With thin sliced tofu you could barely notice that it wasn’t chicken. I will use this recipe again and again. I am looking for a recipe I had a few years ago and cannot find it. Then there is a sauce with veg oil,soy sauce and sugar but I forget the amounts of these ingredients. any help would be greatly appreciated. Hi Diana, What you’re describing sounds like my family’s Chinese coleslaw recipe, I have the recipe here: https://www.browneyedbaker.com/2012/06/19/chinese-coleslaw-recipe/. Hope that helps! I just cooked this tonight and my family likes it. :D (They’re picky, so yay for finding food they like).